Now you can get 1st birthday parties in London hiring AEIOU Kids Club. This is a magical moment for you, and we know that, and that’s why we have designed a special first birthday party that will make your eyes shine! Our great birthday party entertainers will bring to your home, or party venue, lots of love and fun! We also have party catering, party decoration, and birthday party entertainment to make your job a little bit easier. See in detail what we have to offer you. We can provide 1st birthday party in London in many areas including Central London, City of Westminster, Kensington and Chelsea, Hammersmith and Fulham, Wandsworth, Lambeth, Southwark, Tower Hamlets, Hackney, Islington, Camden, Brent, Ealing, Hounslow, and more. So don’t hesitate in contacting us and ask for our kids parties. First birthday parties are an important mark on parent’s life, and that’s why we have some tips to give you. Follow all of them and your 1st birthday party in London will be just perfect. You need to pay attention to a few things when you are planning 1st birthday parties in London. Take a look! You must limit your guest list to close family and friends. Little babies don’t like too much confusion and lots of people around them. You must also plan your first birthday party to one hour, two at the most and to after your baby takes his nap, late in the morning or in the evening. This because he gets tired easily and this way you enjoy your party more time. We know that you are tired! So don’t be ashamed of asking for some help to your mom, dad, sister or to a close friend. You can also hire kids party planners to help you setting up your 1st birthday parties in London. You must think about some games and activities to your party. It is maybe the most difficult part of planning your party, and that’s why we have some children’s party entertainment packages to offer you. Take a look! We have some ideas to give to your 1st birthday parties in London. In fact, we can help you in everything and I can assure you that your 1st birthday parties will be fabulous! Take a look at some fantastic activities that we have planned to make your 1st birthday party in London memorable! AEIOU Kids Club has designed a fantastic storytelling session to please your little baby. A beautiful and lovely story will leave you all delighted! But wait! We have another surprise for you! And what if we tell you a sweet love story in a puppet show? Isn’t it just awesome? I am sure your 1st birthday parties in London will be PERFECT! To make it even greater we have lots of giant bubbles to bring to your boys 1st birthday and girls 1st birthday! Do you imagine how fun it would be all kids running to catch these giant bubbles? I can assure you they will have lots of fun, and I guess they will end up really wet (and they love it!)! Your 1st birthday parties in London will be just outstanding! We still have more offers to you. Let’s talk about girls 1st birthday and boys 1st birthday? We have fantastic ideas to your 1st birthday parties in London. Take a look! Do you imagine how cute your little kids will be with their face painted? Our face painters for hire have beautiful paints to bring to your girls 1st birthday party to make your little girls just pretty and cute! Our silly clowns for birthday parties are just great and they are perfect for your baby girl first birthday. All kids love clowns, and ours are just fabulous. Hiring our clowns or even our clowns show your 1st birthday parties in London will be amazing! For your boys 1st birthday we bring lots of balloon swords! YEY! A real battle with balloons! Your boys 1st birthday will be just remarkable! 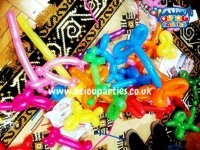 Hire our balloon modelling and your party will be a huge success! Your 1st birthday party entertainment is guaranteed with our birthday party magician. His magic tricks for kids are great and I can assure you that all of you will love him! Your 1st birthday parties in London will be a milestone! Hire our 1st birthday parties in London, Manchester, Liverpool and Birmingham and your parties will be the best of all. I am sure you won’t regret hiring us. Our entertainers will do everything to make all your wishes come true. So contact us now for full info and prices. Don’t forget that we have even more to offer you. In fact we can do everything you want, you just need to ask us. So, book now our kids party services and enjoy our 1st birthday parties in London!